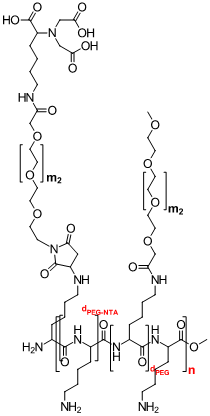 PLL-g-PEG is a random graft co-polymer with a poly(L-lysine) backbone and poly(ethylene glycol) side-chains. The PLL backbone interacts electrostatically with the substrate, while the side-chains extend from the surface to form a densely packed polymeric brush. 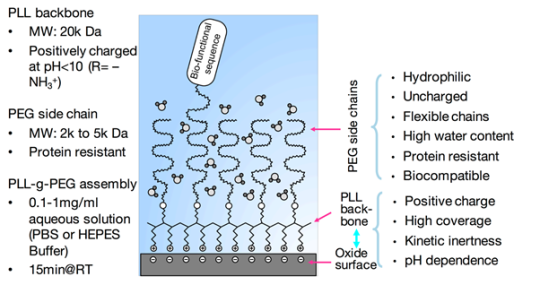 Polymers carrying non-bio-functionalized PEG (methoxy-terminated) side-chains are used for protection against biofouling, i.e. for the reduction of protein uptake, or as cell- and bacteria-resistant coatings, as well as enhancing lubricity. 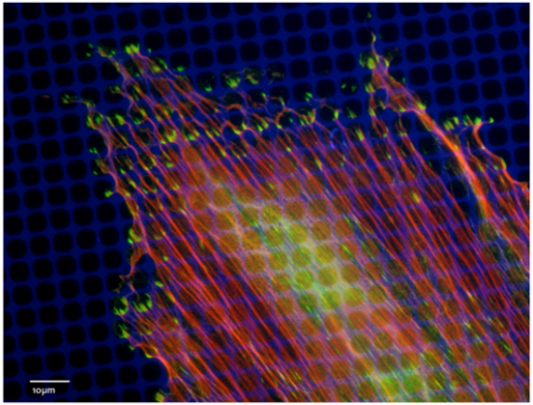 Three fluorescently tagged versions for non-bio-functionalized PEG-based polymers to be used in microscopy applications. Custom architectures (also possible with side-chains other than PEG, such as dextran or PMOXA) available - please ask for a quote! 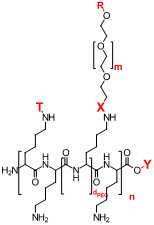 Labels are randomly grafted directly to the polymer backbone (2-4% of the lysine groups) and therefore do not interfere with the protein-resistant properties of the coating. Custom labeling available - please ask for a quote!